We offer Worm Gear Winch Machines for our clients in the range of 250kg to 5000 Kgs. 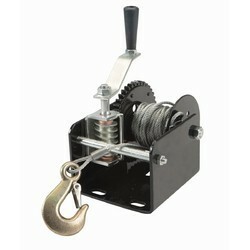 We are completely involved in providing an exclusive range of superior quality Worm Winch. Under the supervision of highly experienced engineers, our offered winch is manufactured making use of quality approved raw material and modern technology. This winch is broadly used in different industries for pulling heavy loads. We offer Worm Gear Winch for our clients in the range of 250kg to 5000 Kgs. With our in-depth knowledge of this domain, we are actively engaged in offering an excellent quality assortment of Wall Winch. Used in various engineering related industries where load has to be pulled from depth or side surface with maximum safety. 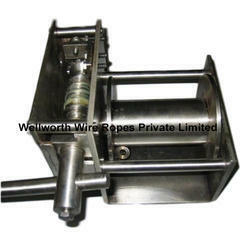 We offer high quality range of Worm Gear Winches. With the support of our expert workforce, we are designing and developing a wide range of winches. These are used for loading, unloading and puling of heavy loads at different speeds. Our range is highly demanded and can be availed at market leading prices. We have been counted amongst the most trusted names in this domain, engaged in offering standard quality range of Worm Gear Winch. We offer a wide range of Worm Gear Winches, which are fabricated from optimum quality raw material. These flat pulleys are highly acclaimed across industries for rigid construction, durability and unending efficiency and functionality. These are available Ex-Stock in C.I. and mild steel pulleys, as per the requirement of the esteem clients. To meet Various erections and repair jobs, our range of electric winches is specially designed for lifting loads and hauling them as well. Perfect for heavy duty works these are known to possess following features. Manufacturing A Wide Range Of Worm Gear Winch Machine. These Machines Are Available In 250 Kg To 2 Tons Of Capacity. Customers can avail us a wide range of Winch Worm Gears in varied specifications. These products are used for loading, unloading & pulling of heavy loads at diverse speeds.